We were so sad to hear that one of our original beloved Peruvian restaurants, Inka Heritage in Madison had closed! On a recent trip to Madison we looked them up to learn about their hours, only to find out that they were closed for good. Fortunately, we learned that the owners went and opened up another restaurant, this time a more casual spot in downtown Madison: Estacion Inka (604 University Ave, Madison, WI 53715). Unlike the more upscale vibe of Inka Heritage, Estacion Inka is a casual quick service place where you order at the counter and sit at the few tables in this clean, bright storefront. However, don’t be fooled by the restaurant’s simple appearance, the menu has many of the same favorites as Inka Heritage. Here, the focus is on roast rotisserie chicken, which comes in a variety of sizes and permutations. Peru is known for its obsession with the perfect roast chicken, and we have tried a few dedicated Peruvian chicken spots in Chicago like D’Candela, so we are glad to see this type of restaurant come to Madison. We were at Estacion Inka on a weekday for lunch, and there is even a very attractive lunch special of a quarter chicken with rice and beans for a staggeringly cheap $5.65. You can also get a quarter ($7.99), half ($9.99) or whole roast chicken with one side: French Fries, Black Beans, White Rice, Cilantro Rice, Sweet Plantains, Fried Yucca, or Salad. There are some pre-defined options if you can’t choose, including the Caribbean special with rice, black beans and plantains ($8.99). We ordered the lunch special and Caribbean plate, and devoured every bite. The chicken was tender and juicy with crispy skin, and the sides were on point. Another key element is the slightly spicy aji pepper sauce to slather on your chicken, which really brought it up a notch. Smoothies round out the menu, including M’s favorite flavor, Lucuma ($4). The tres leches cake ($3.50) and the alfajores looked tempting, but we were so full from our lunch that we had to stop at the smoothie. While we mourn the loss of Inka Heritage, Estacion Inka is a great stop for anyone in Madison craving some Peruvian flavor at a great price. M is a ceviche aficionado, so we did a lot of research to find the best ceviche in Lima, Peru before we arrived. In terms of Ceviche, anyone visiting Lima is absolutely spoiled for choice. Ceviche, which is basically an art form in its native Peru, is simply raw fish or seafood “cooked” in citrus juice and chiles (known as “tiger milk”). However, in our research, we found a few ceviche-centric picks that rose to the top, including El Mercado (Hipolito Unanue 203, Lima, Peru) in the trendy Miraflores neighborhood. Mercado is the brainchild of chef Rafael Osterling, and it is known for offering both traditional and nouveau takes on ceviche. There are no reservations accepted at El Mercado, so in order to get a table, people line up outside before opening time (maybe using the word “line up” is too strict) to get a table. We heard that lunch was an easier sell than dinner, so we waited outside for the restaurant to open for about 45 minutes. When the restaurant finally opened up at 12:30 we were among the first 20 to get in – and we were very happy to have secured a table (though, to be honest, the restaurant wasn’t full at that point, so we probably could have just arrived when it opened, but YMMV). The restaurant itself was partially open to the elements, and live trees grew straight through the floorboards. We enjoyed the woodsy, convivial environment, and it really felt like you were eating outside. We also liked that there was an open window to the kitchen where we saw a bevy of female chefs at work. We were surprised by the sheer size of extensive menu of tiraditos, causas, ceviches, salads, sandwiches, sushi and more substantial wood-fired dishes like lobster and whole grouper. If your taste is not necessarily for ceviche, there will still be dozens of options for you. There are inventive starters including a suckling pig spring roll and scallops in spicy ceviche “tiger milk.” Despite all this choice, we were most intrigued by the two classic categories of Peruvian appetizers: tiraditios, thinly-sliced fish with citrus; and causas, Peruvian potatoes mixed with chilis and other fillings like fish and avocado. We decided to sample the Causa Tumbesina, with yellow Peruvian potatoes, shrimp, crab and avocado (42 Soles), which was a delicious mixture of textures and mild spiciness that we were not expecting. However, the stars of the show are Mercado’s ceviches, of which there are 8 varieties, inspired by different areas of Peru, and the ingredients local to each region. In a dish with relatively few component, every element of the ceviche has to be absolutely perfect, and M certainly has a critical eye for ceviche. Unique options included the “Galactic ceviche” with Lemon Sole, Bull Crab, and Scallops Cooked in Lime Juice and Sea Urchin “Galactic Milk.” We selected two different types of ceviche: the classic Lenguado (55 S): Lemon Sole in Lime Juice, Chili “Tiger Milk” Red Onion, Cilantro, Iceberg Lettuce, Sweet Potato & Corn and the more avant-garde Norte-Norte (54 S): Sea Grouper, Cockles, Shrimps, Green Banana Majado (fried mash) & Chili. The seafood in both ceviches was super fresh and delicate, and was some of the best fish we had ever tried. Each was garnished simply with large Peruvian corn kernels- choclo– and mashed sweet potatoes or plantains. The flavors of each ceviche were clean, simple and not over-complicated. M admired the technical perfection of the Lengaudo ceviche, with its perfectly uniform slices of fish, and just the right amount of onions with a pungently citrus-y tiger milk that was not overpowering. Mercado’s rendition was basically a template for everything a classic ceviche ought to be. We were struck by the purple color of the Norte-Norte ceviche, and the tantalizingly smoky flavor of the chilies. Upon consideration, M deemed the Lenguado as his favorite ceviche of the trip. We would highly recommend Mercado for all things seafood, but if you are ceviche lover, it is a must-try! The first stop on everyone’s Peru itinerary is Machu Picchu, and probably rightfully so, but Peru is full of so many other beautiful natural sites. One of the most impressive places we went in Peru was the Maras Salt Pools / Salineras de Maras, nestled into the Andes mountains. The view of 500+ multicolored salt terraces blanketing the mountains over the Urubamba valley is really a site to see. These salt pools date back to even before the Incan Empire, potentially thousands of years. Today, the flats are still in production during the dry season, May to October, and the process hasn’t changed much in the last 500 years. So how is the salt produced? The shallow man-made pools are fed naturally by a mineral and salt-rich stream, and water is cut off from each pool when it is full. When the water evaporates, the salt is harvested, scraped into baskets, and further dried. Each salt pool has a unique color and mineral content, but overall the salt is fine and pink. Maras pink salt is a great complement to Peruvian ceviche (our favorite), but it is extremely versatile. You can buy Maras salt in specialty stores and online, but it is extremely cheap in Peru. Even if you can’t visit Maras, be sure to pick up some pink salt on your trip! Pachapapa (Plazoleta Plaza San Blas 120) in Cusco is a real retreat from the hustle and bustle of Cusco, with an attractive outdoor dining area in the quaint San Blas neighborhood, enlivened by a Peruvian harpist and a wood-burning oven in full view. Pachapapa’s name is a riff on Pachamanca, a traditional Andean meal, cooked in an underground oven. You can sit either in the outdoor courtyard at large wooden tables, warmed by heat lamps, or in one of many comfortable, indoor side rooms. There is nothing we like more than a good bakery, and we stumbled upon a great one in Lima, Peru’s Panadería El Pan de La Chola (Av Mariscal La Mar 918, Miraflores 15074, Peru). 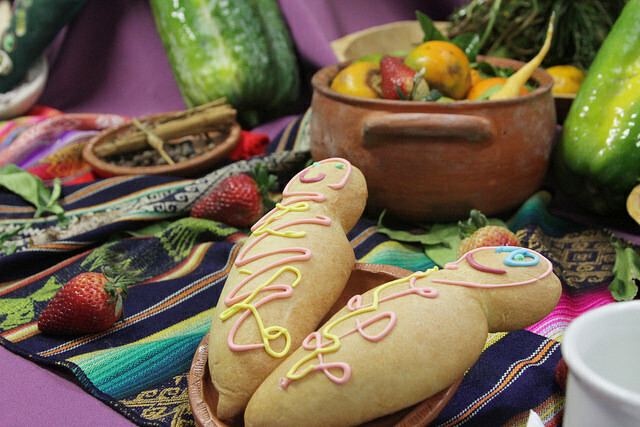 The closest analogue to El Pan de la Chola we know of is Zak’s Bakery in Miami. 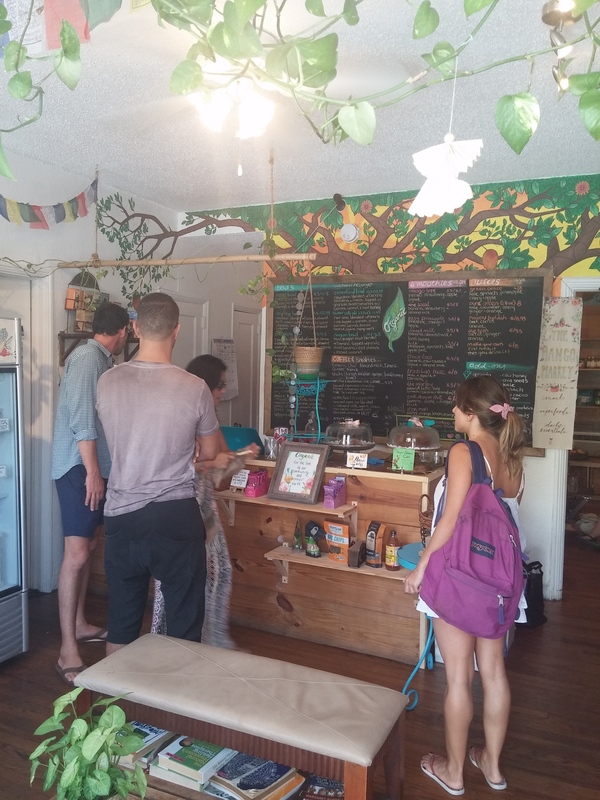 Like Zak’s, El Pan de la Chola, is a bright, airy bakery which serves up breads, sandwiches and coffee in a friendly rustic-chic environment to a enthusiastic crowd of local and expat cognoscenti, students and families. The bakery is run by a British expat, Johnathan Day, who realized his dream of opening a bakery in Peru. There has been a major food renaissance in Peru in the past 15 years, and though the gourmet epicenter of Peru is still the capital city of Lima, foodie-mania has been spreading throughout the entire country. Cusco, for example, a thriving city in the midst of the Andes, with a strong mix of Incan and European traditions, is also getting in on the Peruvian food revival. Nowhere is it more apparent than at Cicciolina (2nd Floor, Triunfo 393, Cusco, Peru), a restaurant that boasts a wide menu of Peruvian-style tapas and modern dishes with Mediterranean twists on Peruvian ingredients, known as Novo Andino (New Andean). We are back from the culinary wonderland that is Peru, and what impressed us the most was the obsession Peruvians – especially Limeños – have for quality food, from the corner sandwich shop to the finest dining. So we started our adventure on the humble street corner with one of the many Limeño food obsessions, the sandwich. In Lima the classic sandwich is the chicharrón – fried pork, sweet potato slices and onions on a bun – and sandwich shops serving this variety and many others are on every corner. In our hunt for sandwiches in Lima, one name that kept popping up was La Lucha, a much-hyped sandwich place with locations throughout Lima (we visited one of the locations near Parque Kennedy in the Miraflores neighborhood – Av. Diagonal 308). La Lucha does a wide variety of “criollo” sandwiches, including the famous chicharrón. Other options included roast chicken, roast turkey (surprising! ), roast pork, tuna, jamón Serrano, country ham and steak, cheese and avocado (between 6.8 and 17.3 soles). We ordered a roast chicken, since that is one of our favorite Peruvian staples (and you will see rotisserie chicken places everywhere!) and a classic chicharrón. The La Lucha location we visited was a walk up counter where you placed your order and paid at the counter, and later received your food at your table. La Lucha was packed with hungry students from the nearby university even at the early hour of 5:30 PM (much too early for a Peruvian dinner! ), and the vibe was lively and colorful. Not long after ordering we received crusty rolls piled high with juicy roast chicken and cracking pork and sweet potato. They definitely didn’t skimp on the fillings! Though the sandwiches were delicious, what may have been the real star of the show were the fries made from the celebrated huayro potatoes, which were skin-on, crispy and piping hot. These were some of the best fries we have ever had, which makes sense given that potatoes are originally from the Andes. Plus, the fries came with all manner of dipping sauces (mayo, tartar sauce, olive, aji pepper, etc). La Lucha is also an excellent place to dip your toe into more unique Peruvian fruits including aguaymanto (similar to a ground cherry) and granadilla (similar to passion fruit) through a variety of juices and smoothies. If you are thirsty you can also get chicha, pisco or coffee. But most impressively, none of these sandwiches cost over $5 US! If we lived in Lima we would come here all the time. La Lucha is the perfect place for a quick, delicious meal, and to get a taste of what real Limeños eat on a daily basis. It’ a delicious introduction to Peru! On our way to Peru! ​If you’ve been keeping up with our Instagram, you will see that we’ve been featuring photos of the dinner we recently had at Next Resatuarnt in Chicago, with the theme of South America (specifically Peru). We really enjoyed the meal (review coming soon), and it helped prep us for our trip to Peru, which starts today! On that note, ETW will be taking a summer break until July 15. If you have any last minute Peru recommendations let us know! Help us with Peru food and dining suggestions! We are about to embark on a 10-day-long trip to Peru in July, and we are so excited to see the sights, but we are even more excited about the food, which has long been one of our favorites (particularly for M). However, we are feeling a little overwhelmed by all of the choices for food options, especially in Lima, where we are looking forward to an abundance of ceviche. So we are asking you, dear readers, what are your favorite places to eat in Peru (in Lima, Cusco and the Sacred Valley)? Where (or what) should we avoid? We are thinking of one fancy meal – do you have any favorites? Thanks in advance for your help! When we think of Peruvian food, we usually make the beeline for the ceviche, one of Matt’s favorite dishes OF ALL TIME. However, another thing Peru does really well is awesome, crispy, juicy rotisserie chicken. And sometimes you are not feeling fish, you are feeling chicken! So where to indulge this craving? One stop that came highly recommended, specifically for chicken, was D’Candela (4053 N Kedzie Ave. Chicago IL), part of a boom in Latin American chicken restaurants in Chicago. D’Candela does have a lot of other Peruvian dishes on its menu, including ceviche as an entree (but not an appetizer), and other classic dishes we love like papas a la huancaina and arroz chaufa. But this review is entirely for the chicken. You can order pretty much any size that suits your fancy from a whole, half or quarter chicken – and you can choose between the white or dark for the quarters. The prices are pretty reasonable too ($16.95 for a whole chicken with 2 sides, and a quarter chicken and 2 sides for only $6.85)! Many people were getting their chicken to go, but D’Candela is a BYOB, so why not stay a while? We got two orders of quarter chicken, one light and one dark meat. You also get to pick two sides ( sides = French Fries, House Salad, Fried Sweet Plantains, Yucca, Rice, Pinto Beans) – so we went with the fried yuca and plantains for the complete meat ‘n’ potatoes experience. 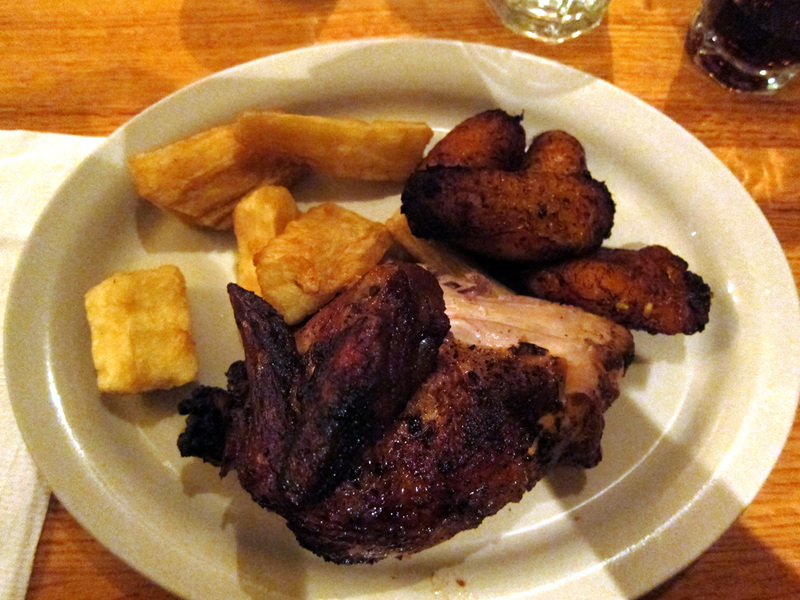 The chicken came with yellow aji sauce for dipping, which was excellent, particularly for the yuca. The chicken had a nice crispy exterior, but the meat was moist and juicy. Even the white meat was completely succulent. No grease, either. This was some tasty chicken, and there is definitely no need to make it home when you can get it here. We think we will be fulfilling all of our future chicken cravings at D’Candela. Washed down with a cold chica morada (purple corn drink), we can’t think of a much better dinner! As interest in Peruvian food continues to grow in the US, and especially in Chicago, we’ve seen an increasing number of haute Peruvian restaurants open up – the surest sign a cuisine is taking on a big audience. Tanta, in River North, is one of the most recent high-end Peruvian restaurants to open in the city, and we were eager to give it a try. Its menu seemingly sets it apart from its competitors, with an emphasis on some highland dishes (most “Peruvian” food in the US is from central coastal Peru) as well as nikkei dishes inspired by Peru’s heritage of Japanese immigration. Overall a bit pricey for the fare, we were overall impressed by Tanta’s offerings and ambiance. Our amiable and perfectly attentive waiter began our evening with fried choclos (large Peruvian corn kernels), a typical starter snack. We quickly paired these with the anticuchos – marinated and grilled beef hearts served with potatoes, corn, and huacatay ($9). We also got some plantain chips served with aji amarillo. This sauce gave us a clue for the evening: Tanta does not skimp on spice levels. Given the bold flavors in the starters, M was particularly excited to try the ceviche. Sparking our interest was the leche del tigre flight ($15), which will definitely merit a try on a return visit. “Tiger Milk” is the name given to the mix of citrus marinades left at the bottom of a bowl when one finishes eating a ceviche. Typical protocol requires you to pour the remainder in a shot glass and drink it straight; Tanta does one better by offering a full flight. Still, M decided to go with a more traditional cebiche tasting menu ($28). While it typically includes three of Tanta’s best ceviches – clasico, mixto, and nikei, the kitchen made a small mistake so we actually received a fourth, the criollo. The mixto (“Mixed”) and clasico (“Classic”) are old standbys for any Peruvian restaurant; the former at Tanta showcasing mahi, squid, shrimp, and rocoto; while the latter always includes whitefish (in this case fluke) marinated in lime juice, red onions, and cilantro. Both impressed M with the powerfully authentic spice level, and showed that the kitchen was not willing to compromise on authenticity. The criollo was a small twist on the mixto – the same proteins, only this time marinated in the aji amarillo that was such a hit on our first course. The nikei, however, was the big hit of evening: tuna and avocado marinated in tamarind and garnished with cucumber, this was a great fusion ceviche that is worth a full plate at Tanta. From left: cebiche clasico, nikei, and mixto. Ceviches downed, tiger milk drank, we were already getting full. But on this night on the town, we still had our mains coming. We chose a selection from the “Del Chifa” section of the menu, which came with a blurb: “In the 1800s, people from Canton immigrated to Peru and brought their amazing culinary culture.” Representative of this, and recommended by the waiter, was the chaufa aeropuerto ($23). A hot stone dish was served to us containing pork fried rice, a shrimp tortilla, and accented with spicy garlic. Mixed all together this dish was a big hit, a marriage of bold and trans-Pacific flavors that are distinctly representative of the history of Peruvian cuisine, and rarely featured on other Peruvian menus. Tanta’s offerings include many other dishes in this vein, and we are eager to return to try more. Overall, Tanta’s bold flavors and spices, crossed with its trans-Pacific emphasis, really impressed us. The trendy atmosphere was a bit much, and the prices perhaps a little high, but the quality and inventiveness was there, perhaps moreso than at any other Peruvian restaurant we have tried in the city. Great for adventurous clients, or a foodie date you want to impress, or someone who wants a great cross-section of Peruvian history through food. Happy Peruvian Independence Day! Thankfully, Chicago is home to an assortment of Peruvian restaurants where you can celebrate culinarily. One of our favorite places to get Peruvian in Chicago is Taste of Peru. ToP is located in an unassuming stripmall storefront on North Clark and despite the small size of the restaurant, the menu is quite extensive. The restaurant has an expensive selection of seafood, including a few varieties of M’s favorite citrusy seafood salad – ceviche. For entrees- The aji de gallina ($11) – shredded chicken in walnut sauce and Lomo Saltado – Peruvian rib-eye ($11) are both excellent, and there is even live music on weekends. Peruvian is the new Thai? We hope so! We are huge fans of Peruvian food – and are excited it is gaining a foothold across the USA. The New York Times has a piece about Peruvian food’s popularity in San Francisco. Fortunately we in Chicago are lucky enough to have a variety of Peruvian joints to choose from. We loved Rosa de Lima, and we have a review of Taste of Peru coming soon. On May 31, I walked up to the door of Restaurant Magnus in Madison, hoping to sample some of my favorites from its South American-inspired menu before the restaurant’s dramatic shift the next day (signaled by the Norwegian flag fluttering over the canopy). It was locked. An employee eating outside quickly walked up to me, saying – with a wide smile – that the restaurant was closed to the evening to prepare for their exciting new menu the next day. But all the dishes I wanted were on the old menu, and when Magnus got rid of them on June 1, both L and I were disappointed and frankly a little angry. We’ve had great experiences at Magnus before – in fact, it is L’s official birthday place. The funky interior always got things rolling: live soft bossa nova or Spanish guitar music playing in the background formed a strange, but ultimately satisfying romance with deer antler chandeliers and brown leather seats. But as always, we come for the food. We start with an order of chimichurri ($3.00) paired with light and fluffy foccacia (the tomato-flavored was our favorite). The chimichurri was unlike any we had seen: parsley, red wine vinegar, coriander, and honey made for a creamy dip that was nothing short of the perfect appetizer. For main dishes, we tended to migrate toward the ever-changing tapas menu, but there were some old favorites that kept bringing us back (and Magnus knew it, because they kept putting them on. The Peruvian bay scallop ceviche ($12) was an interesting take on an old classic, with diced scallops placed in a makeshift bowl of cucumber slices, garnished with minced mixed sweet peppers, avocado, and drizzled with mango-habanero (M’s favorite combo) vinaigrette. It was smaller than similarly priced ceviches but the inventiveness was worth it. Same with the Cana de Oveja ($14). Spanish cheese in phyllo dough, garnished with figs (another of M’s favorites), pistachios (OK, so that was a bit confusing), sherry butter sauce, and habanero syrup. This is a dish we didn’t really know how to classify, most because the multitude of flavor options on any given bite always kept us guessing – and that is what made it good. And then there was the Xinxim. Take a Brazilian staple and create the hell out of it, and you get Magnus’ Xinxim. It sounds simple enough on the menu: chorizo verde, blackened chicken, blackened beef all in a bowl, sitting in a special cream sauce of habanero and coconut milk and cashews. But this seemingly simple dish was, unquestionably, my favorite meal of all time. The coconut milk worked to take down the habanero’s heat enough to let its fruity tropical flavor beam through, and combined with the cashews, the effect was deliriously perfect. The chorizo was always spiced to perfection, and the chicken, beef, and shrimp provided a wide set of texture and flavor options that always worked in tandem with what I am sure will remain the best cream sauce I have ever eaten. There were others, of course: cheese plates, small desserts, etc. too numerous to name here. But the bottom line is that they are all now gone. Replaced with cod, venison and the other staples of Norwegian cuisine that, to us, make obvious the reasons why no Scandinavian restaurant has ever really succeeded in this most Scandinavian of states. We understand the reason for the change, at least on a cultural level. The restaurant’s sous chef – of Norwegian descent – was promoted to the head spot (and there is a now a triumphant photo of him planting the Norwegian flag on the restaurant’s redesigned website). All the owners are Norwegian. The restaurant is even named for a Norwegian grandfather. But culinary, we can’t say this move makes any sense. Scandinavian restaurants have had a tough time of it in this country, and Wisconsin would seem like a logical place to start one if, well, Scandinavian food had ever succeeded here before. The chimichurri is still on the menu, though hiked in price by a dollar and paired with rye bread instead of foccacia. Will we try the new menu? Probably. We got an email coupon for a free first course. But aquavit mussels and pickled cabbage not only sound less than appealing – they will never replace that xinxim. All we can say is they had better give us the recipe. First off, Inka Heritage gets major cultural awareness points for using Juan Velasco’s 1975 Quechua orthography that spells “Inka” with a K instead of a C (which is an Imperial Spanish spelling). Velasco wasn’t the best guy, but his transliterations were top-notch. Well done. Now on to the food. 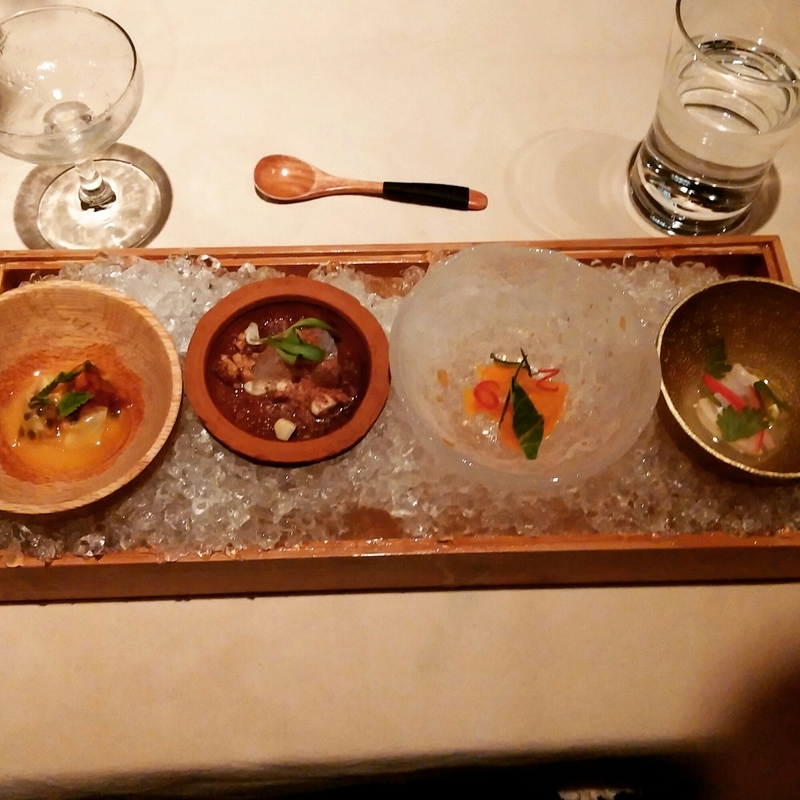 We tend to review a fair amount of Peruvian restaurants, and with good reason – we feel that Peruvian cuisine is well on its way to competing with Thai food as a major player in the US food scene. Which is why we were so excited when Inka Heritage, the first Peruvian restaurant in the Madison city limits, opened in 2007. We have been back multiple times since our first visit shortly after the opening (when they could not make nearly half the items on their own menu) but are happy to report that the restaurant has grown into its own with great interpretations of all the classic Peruvian dishes, as well as the best lúcuma mousse we’ve found outside Peru. At most Peruvian restaurants, I have my set of usuals: anticuchos, an originally Afro-Peruvian dish of skewered, marinated pieces of beef heart with a side a ají, and ceviche pescado acid cooked in citrus juice and garnished with sweet potatoes and big corn (I still don’t know the proper name for it). L likes to get the aji de pollo, shredded chicken smothered in an aji cream sauce garnished with a hard-boiled egg and served with rice. And for dessert, we split the aforementioned lúcuma mousse; made from an Andean fruit rarely available outside of South America with a taste somewhere between sweet potatoes, maple syrup, and cashews. It is delectable. Inka Heritage does all these things, and does them well. The anticuchos are true to the original dish, using the best pieces of beef heart muscle (some other restaurants keep the anticuchos marinade but substitute white meat chicken for the beef hearts, which is not only inauthentic but culinary highway robbery) with a slightly spicy, tangy marinade that works well with the ají on the side. The ceviche too is solid, with the right citrus juice mixtures we’ve come to expect – though the very high onions to fish ratio, as well as the smaller serving size, makes us wonder why the price is higher than what we found at Rosa de Lima in Chicago. L’s aji de pollo is a failsafe dish, one we do not always see at other restaurants, and well worth it at Inka Heritage. The dish’s cream sauce is packed with interesting flavor combinations (“yellow pepper, garnished with roasted walnut, fresh parmesan cheese, botija black olive, boiled egg” says the menu) that are probably best suited to the shredded chicken, allowing all the flavors to surround each chicken piece. Mix in with the rice, and it is easily one of Inka Heritage’s best dishes. The menu does, of course, offer a number of other options outside of our traditional favorites that are well worth sampling, particularly in the seafood department. Overall, Inka Heritage can run a bit on the pricy side (the average entrée is about $13), but the restaurant’s increasingly elegant ambience (considerably moreso now than when it opened) make it a great place for a classy night out with a group or date. Madison has a number of great dining options, but we try to get back as often as we can – especially to introduce friends to Peruvian cuisine who have not tried it before. The Eaters decided to go global (as we always do) and celebrate a South American New Years ’09. We began the night with a visit to a restaurant so new that the old sign from the previous occupants – Cancun Mariscos – still hangs in front of the building. But don’t be fooled – Rosa de Lima, Bucktown’s newest Peruvian restaurant – is definitely there, and we think it has some of the best Peruvian cuisine we’ve had in Chicago. Given the great reviews it got on Yelp and the fact it was New Year’s Eve, we were in a bit of a rush to make sure we arrived on time for our 7:30 PM reservations. We were a little surprised to find that, upon arrival, we were the only diners in the entire place. This is usually a bad sign, so we walked in assuming the worst. The decor was nice enough – dark, candle-lit booths and white tables flanked with wall-sized photos of famous sights in Lima make this a good date place, and particularly fun for anyone whose visited Lima and knows the mural locations. Our fears increased, however, when the waitresses muted the Spanish TV station blaring on the restaurant’s far side and instead turned on a steady bad stream of late 1980s / 1990s rock (Blues Traveler?). We still do not understand why so many world eateries play really bad American music, but after all, we’re not there to listen, we’re there to eat. And eat we did. The evening began as our amiable waitress addressed us in Spanish (good sign on the authenticity index) and immediately brought us a full pitcher of water as well as two small cups chicken and wild rice soup with green beans. The soup was a great, light appetizer for what turned out to be a larger meal than we expected, and the Eaters are always impressed with solid free food before a meal. The water of course is necessary to cool the heat of the aji, a spicy Peruvian dipping sauce made with the pepper of the same name. We got a basket of semisoft and strangely-spiced bread to dip in the aji – it reminded us more of Italian bread than a Peruvian staple, but we let that one slide. For the appetizer, M ordered one of his favorite dishes from his time in Peru: anticuchos, skewered cuts of goat or cow heart muscle, marinated in vinegar or oil and spices, then grilled. Some Peruvian restaurants in the US cater more to American crowds by substituting other cuts of meat for the heart muscle, but we think the real thing is better. The meat is very lean but not tough, while the marinade adds a nice, subtle kick without being overpowering. M thinks this is a hallmark of good Peruvian food – a good amount of subtle spices and a touch of heat that work well with the texture of the cuisine, without having sauces or marinades overpower the base ingredients. Anticuchos are a great example of this, as was L’s order: 1/2 baked chicken. The 1/2 Roasted Chicken with 2 side orders was a steal at $8. The chicken had a delicious spice rub and the chicken itself was moist and tender. Some of the best roast chicken I have had in a long time. The chicken platter came with a choice of two side orders – L got the Potato purée with milk butter and nut nutmeg and Tostones (fried plantains). The potato puree was like a soupier version of mashed potatoes (potatoes are big in Peru) and the tostones were deliciously crispy. But if there is any dish where the marinade makes the meal, it is ceviche de pascado. M’s all-time favorite dish is an automatic-order whenever we’re at a Peruvian restaurant, but if there is one complaint, it’s that the order is always too small to be a full meal. That’s probably in the nature of the ingredients: ceviche de pescado is fresh, raw fish marinaded in citrus juice (in Peru, usually lime) and garnished with cilantro, onions, sweet potatoes, and oversized kernels of Peruvian corn (see photo). This ceviche came with a $12.95 price tag, a little less than most other ceviches I’ve seen on Peruvian menus, so I naturally assumed it would be smaller – but was shocked to find it nearly twice average size. It was a struggle to finish the entire plate, sweet potatoes and all, but by no means unpleasant. To finish off we wanted to order some lucuma ice cream, but they were all out, so we ordered some Alfajores ($2.25 for one). Alfajores are basically two cookie wafers sandwiched with dulce de leche. The Peruvian version is covered in powdered sugar, unlike Argentine varieties, which are covered in chocolate. All in all, we were very impressed with our meal – the service was great, the price was right and the food was excellent. We can definitely say that Rosa de Lima is the best Peruvian food we’ve had in Chicago. We hope they get more crowded than they were on New Years Eve, because Chicago needs this kind of cooking.